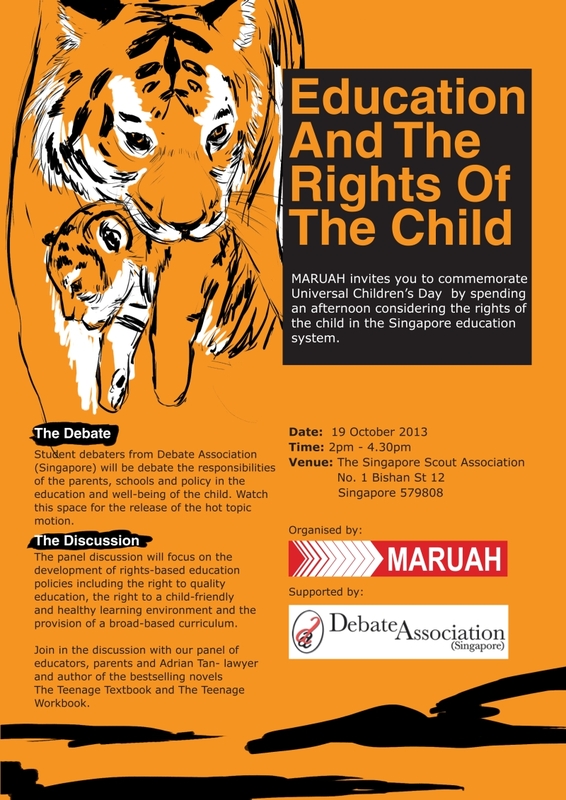 MARUAH invites you to commemorate Universal Children’s Day by spending an afternoon considering the rights of the child in the Singapore education system. Student debaters from Debate Association (Singapore) will be debate the responsibilities of the parents, schools and policy in the education and well-being of the child. Watch this space for the release of the hot topic motion. The panel discussion will focus on the development of rights-based education policies including the right to quality education, the right to a child-friendly and healthy learning environment and the provision of a broad-based curriculum. Join in the discussion with our panel of educators, parents and Adrian Tan- lawyer and author of the bestselling novels The Teenage Textbook and The Teenage Workbook. This event is organised with the support of Debate Association (Singapore). Please register via the link below. This entry was posted on Tuesday, October 8th, 2013 at 10:08 am and is filed under Commemoration, Events. You can follow any responses to this entry through the RSS 2.0 feed. You can leave a response, or trackback from your own site.